Is it possible to build a lamp from a plant? It would seem so. 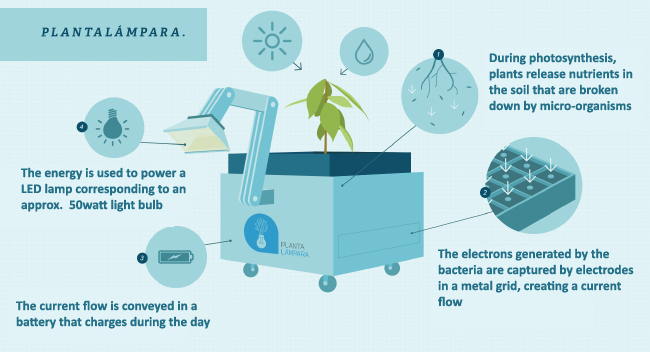 The confirmation comes from Peru, where engineers from the Universidad de Ingeniería y Tecnología (UTEC) of Lima have created “Planta lampara“, a lamp powered by the energy produced thanks to the combination of plants and bacteria. Prototypes of the eco-invention, made by the team of Prof. Mundo Elmer Ramírezin, have been distributed to the community of Nuevo Saposoa, a population which lives without electricity in the Peruvian jungle. The operating principle of the Planta lampara seems rather simple. Plants, selected from locally available species, are placed inside a terrarium. In the terrarium, besides the soil, are microorganisms called geobacteria and a metal grid with electrodes.The microorganisms are able to degrade the compounds released from the roots of the plants, producing electrons through an electrochemical process. The electrons produced are captured by the electrodes on the metal grid and the current flow that is generated is in turn stored in batteries. The system thus powers an approx. 50Watt LED lamp. The revolutionary UTEC LED lamps will replace the kerosene models, very harmful for the population of the Peruvian jungle, which until now have been the only solution for working and carrying out common tasks also after sunset. The hope is that NGOs, institutions and local governments will increasingly invest in eco-inventions such as this one, capable of combining creativity, research, innovation and development for society. Not forgetting, in fact, that even today, for more than 1.5 billion people, sunset means darkness or the dim light of a lamp.